Whitesell is proud to announce its inclusion in the recently featured article, “South Jersey Update: 2016 Looks to be a Great Year!” appearing in the February issue of New Jersey Business Magazine. 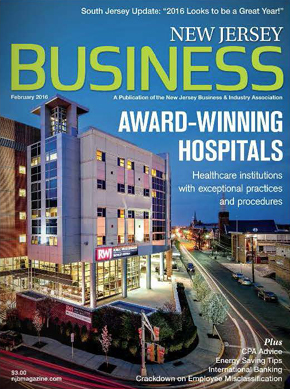 The article, written by Eric C. Peterson, discusses the economic growth climate in the southern New Jersey region across new housing starts, expansionary investment in new college facilities, Camden projects fueled by NJEDA’s Grow NJ tax credit award program, and positive 2015 industrial leasing results and trends going into 2016. James Whitesell, VP / Leasing & Marketing cited Whitesell’s 2.25 million square foot of leasing activity over the past year as an indicator of the southern NJ region's economy strength along with the trend towards generally longer lease term renewal commitments, smaller tenants re-entering the marketplace, and the Haines Center and NJ Turnpike Exit 6A location solidified as a premier distribution and logistics hub market. To view the New Jersey Business Magazine article, click the link below and see pages 44 - 50.